At the heart of the estate stands the Saint Martin Peak (elevation: 111 meters), one of the highest of the area, with a spectacular view on the beaches and the creeks around. It holds the oldest ruins of our region, showing its importance in the ancient times. 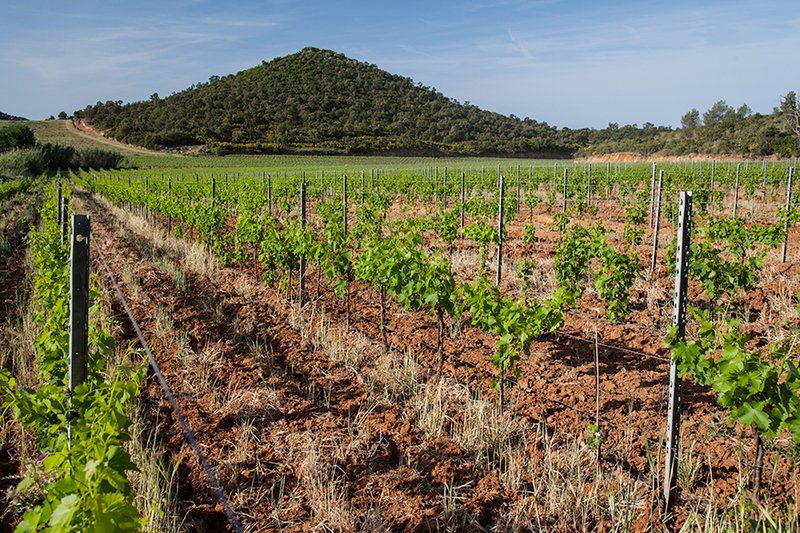 Most of our plots are located at the feet of this peak, among it the plots composing this cuvee, a majority of old vines harvested by hand. The hand harvest allows us a selection of the grape berries in the plots. It starts with the Syrah, partially destemmed to begin natural fermentation process. In every vintage, Syrah is the core of the blend, usually made during the harvest, in a sole tank. Grenache is always a part of it, bringing its generosity. In some years, another grape variety can complete the cuvee, as Rolle adding softness and freshness in the hottest vintages. Winemaking consists in very soft extraction, close to infusion, during 15 to 20 days. Only the free-run juice is kept for this cuvee, and the aging lasts six months in concrete tank. Only a gentle filtration is processed before the bottling. The nose is expressive with red fruits and black fruits aromas, blackberry gently dominating, with fragrances of cherry and a hint of black pepper. With the air it shows spicy aromas, with typical Mediterranean notes. Round and delicate, the mouth is supple, well balanced, with beautiful smooth tannins and final freshness. It’s a typical representation of traditional red wines in Provence: they’re very tender and juicy. This wine will be at its best during his first 3 years of bottle, served between 14 to 17 degrees Celsius, with grilled meat, peppery pasta, tapas, Lebanese mezze, sausages and cheeses. In strong vintages it can be cellared for 2 to 4 more years.